Last year zoning turned 100. What will the next century bring? Berenice Abbott's 1935 photograph "Seventh Avenue Looking North From 35th Street" demonstrates how zoning produced striking streetscapes like this one. A bumper sticker tacked to a bulletin board at the San Francisco Planning Department reads “World Peace Through Zoning,” a sentiment that reveals the vision of zoning as cure for all ills as well as the futility of that notion. (As does the physical heft of the zoning code itself, a 2,000+ page and growing, document). In this issue we’ve invited planners, architects, journalists, economists and others to weigh in: What should change? What should remain? Will we, as New Urbanist Andres Duany suggests, look forward to the day zoning no longer exists at all? The early history of zoning is the story of how New York struggled to negotiate the competing tensions of modern urban development, balancing private real estate rights and public welfare, anxiety over change and excitement for the new, and the imposition of order against the promotion of growth and innovation. Indeed, early and ongoing debates over zoning have reflected a century of evolving ideas about what constitutes an “ideal” city. New York’s 1916 zoning ordinance grew out of more than two decades of debate over how to manage the city’s physical development in the face of unprecedented growth. By 1900, New York City was the manufacturing and financial center of the United States and the second most populous city in the world after London. With limited government regulation to guide building, individual developers and landowners shaped the landscape to suit their own needs, squeezing tenements, skyscrapers, warehouses, and sweatshops into the city’s 19th-century urban fabric. As old New York gave way to a chaotic, modern metropolis, there emerged a general consensus that this new era of urban life required more governmental intervention. The city’s new skyscrapers elicited excitement but were also debated in the press for the way they cast long shadows and led to an oversupply of office space. Tall buildings emerged in the 1880s due to advances in steel-frame construction and elevators and by 1913, the financial district in lower Manhattan housed the highest concentration of skyscrapers in the country. With few regulations, most developers built economical skyscrapers that took the form of large blocks extruded directly from their lots, transforming New York’s streets into dark canyons. At a time when offices depended on natural light and air, the skyscrapers’ long shadows wreaked havoc on neighboring rents and real estate values. Tall buildings were also viewed as a menace to public health for the way they deprived the streets below of sunlight and air circulation. When the Equitable Building opened in 1915, it quickly became a symbol of all that was wrong with a laissez-faire attitude toward skyscrapers. Its extraordinary size (at 542 feet it was the fifth tallest in New York) cast a shadow that covered 7.5 acres and added to the overbuilding of office space. Arguing that the Equitable lowered their property values, nearby landowners were granted reductions in city assessments, making building bulk an issue for city finances. New York’s dynamic economy made neighborhood change a constant, disrupting real estate investment and creating tense battles over land use throughout the city. And the need for government regulation seemed evermore urgent after the consolidation of the five boroughs in 1898, which brought vast expanses of undeveloped land and low-density communities into Greater New York. As the city’s dual subway system was poised to open these huge tracts of land to development, city officials and reformers wanted to ensure that the “mistakes” of Manhattan — congestion, dark streets, and an unstable real estate market — would not spread to the outer boroughs. Amidst a growing sense of crisis, the city convened two banner commissions from 1913 to 1916 to study existing conditions and determine how a “zone system,” a planning concept imported from Germany, could be applied to New York. New York’s zoning commissions were composed of prominent professionals from private real estate and from the nascent field of city planning to ensure that the outcome would balance the needs of both groups. The final ordinance was primarily the work and vision of two men, Edward Bassett and George Burdett Ford. Bassett (1863-1948) served as chairman for both zoning commissions and has been called the “father” and “midwife” of American zoning for the prominent role he played in establishing New York’s code and helping to institute the system around the country. A lawyer by training, Bassett spent much of his life in the public sector, and was responsible for providing a legal framework for this new regulatory system. Ford (1879-1930) was instrumental in developing and illustrating zoning’s complex building regulations. He had studied architecture and engineering at Harvard, MIT, and the École des Beaux-Arts in Paris. Ford dedicated his career to the nascent field of city planning, serving on New York’s landmark zoning commissions and then returning to France in 1917 to help re-plan and build cities that were badly damaged in World War I. Ford became the general director of the New York regional plan in 1930, the same year he died unexpectedly. Knowing that zoning would have to pass court muster, the commissioners laid out their case in a Final Report (1916), a document of legal craftsmanship. Bassett had the crucial insight to frame zoning not as a restriction of private property rights, which would have required the payment of compensation under the Fifth Amendment, but as a process that protected the public welfare and was therefore an exercise of the government’s police powers. The report downplayed the role zoning would play in stabilizing the real estate market and emphasized the role it would play in limiting congestion and increasing access to light and air. New York’s landmark zoning ordinance consolidated various regulations into one comprehensive set of city-building rules. The commissioners were careful to build on existing legal precedent, relying on prior zoning regulations passed in other U.S. cities, such as Los Angeles’s landmark 1908 citywide land-use zoning law, which had established seven industrial districts and designated most of the remaining territory for residential use. The law was in part aimed at moving Chinese laundries out of residential areas, as only specific businesses were allowed to operate within these districts. In 1915, the U.S. Supreme Court upheld the legality of Los Angeles’s zoning and a city’s right to regulate and separate land use to protect public welfare. The commissioners also drew from the country’s height-limit regulations, which had been adopted in the wake of the skyscraper. In 1892, Chicago limited the vertical growth of its famous Michigan Boulevard. Similar laws were passed in Washington, D.C. in 1899 and in Boston in 1903. The U.S. Supreme Court declared height restrictions constitutional in 1909. 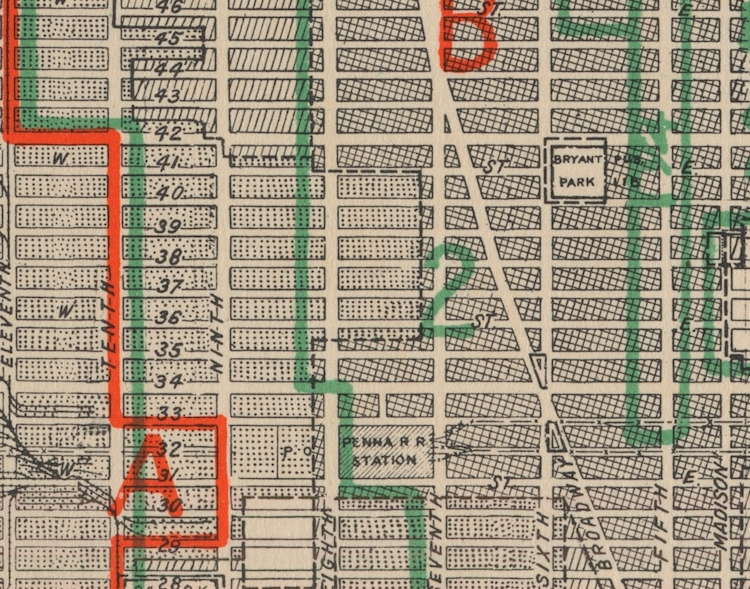 Understanding that each neighborhood or street in New York had a particular character and level of density, the commissioners divided the city into different “districts” or “zones,” sometimes just a block long, each with its own set of rules. (This differed from the building code, which applied rules evenly to the entire city.) The commissioners sought to bring stability to development by giving government officials the power to do two things: regulate building bulk and separate land uses. If the commissioners viewed New York as the product of chaotic and disorganized growth, zoning, in their eyes, was going to usher in a new era of planned, rational development. Instead of mixed-use neighborhoods, their plan separated the three primary uses of the city (residential, commercial, industrial) into different areas. If Manhattan was dense and dark, then future development would prioritize light and air. Most importantly, if most New Yorkers in 1916 lived in substandard housing, the city would henceforth protect the environment of the home. However because regulations only applied to future construction, this vision depended on private developers to build structures the code allowed. With its roots in nuisance laws, the code specified what could not be built in certain areas. Until the introduction of “incentive zoning” in the postwar period, officials could not use zoning to actively build the city. Since most of Manhattan had already been developed, zoning was applied in its more ideal form to the outer boroughs. There, Bassett created neighborhoods of housing and concentrated commercial uses to main thoroughfares to protect residences from encroaching businesses and factories. The 1916 ordinance thus reinforced an emerging idea of city life, made possible through the expansion of rapid transportation, where one’s suburban home was separate from the workplace. To “protect” shops, homes, and offices from encroaching factories, the 1916 code established 3 basic use districts: residential, business, and unrestricted (or industrial). While these designations seem clear, initially there existed numerous caveats that allowed a finer grade of mixing, from non-conforming buildings to grocery stores in residential districts. Over time, however, as wealthy New Yorkers became familiar with the protective nature of zoning and its ability to exclude undesirable residents or building types, they tended to lobby the city for an increase in that protection. In 1917, 16% of zoning amendments tightened restrictions on what could occupy land or be built. Five years later, it was 77 percent. The trend over time, for zoning in New York and other American cities, has been for zoning rules to become more restrictive and for districts to be further stratified into different types. What Bassett’s team had originally intended as a tool to protect the home quickly became a device for instituting local preferences and segregating social groups. Similar unintended consequences occurred with zoning’s bulk regulations. The “skyscraper problem” for the 1916 zoning commissioners was not simply about height; their specific concern was the way that tall buildings shut out light and air from the streets below. The simple height limitations passed in other cities did not address this issue, so New York’s commissioners instead decided to regulate a building’s bulk in relationship to the width of the street it fronted. Wider avenues, which provided more space for sunlight to reach the street, would support larger buildings; narrow streets required a more human scale. The “setback principle” allowed building fronts to rise a multiple of the street width before having to step back from the street. The principle encoded a set of urban values, where buildings had to be shaped to t the character and needs of the streets they inhabited. Because the 1916 zoning code was passed in the midst of a depressed real estate market, it wasn’t until the boom of the 1920s that its impact was fully realized. The effects of zoning were especially felt in midtown, which grew into the city’s second business district in the 1920s and became a neighborhood of mammoth ziggurats. The 1916 zoning code not only gave rise to the “setback skyscraper,” buildings which were designed to maximize their zoning envelope, but also increased the size and scale of construction in the city. The new setback rules made it uneconomical to build skyscrapers on small lots, as now a smaller proportion of the lot could be devoted to leasable space. The solution was to assemble larger lots, and as a result, the real estate market began to concentrate into the hands of larger developers, who could afford them. It was the end of the small-scale lot-by-lot construction of the 19th century and the beginning of the modern development corporation. Over the past century, zoning regulations have changed in tandem with the urban values and ideals of each era, from the promotion of the single-family home in the 20th century to today’s concern for affordable housing. Indeed, the early history of zoning shows how the zoning code, since its inception, has often been aspirational, expressing a vision for a future city. As such, zoning highlights the dissonance that often exists between theory and practice, between optimistic projections and reality. Andrea Renner was the curator of Mastering the Metropolis: New York and Zoning, 1916–2016. The advent of zoning corresponded with, and helped to facilitate the suburbanization of the United States, and with it segregation by race, class, and household type. While explicitly racial zoning was outlawed in 1917, zoning out multifamily housing and industrial jobs provided an effective proxy, aided by nefarious financial policies that kept minorities out of the housing market. With new suburbs zoned exclusively for single-family homes, zoning helped sift America into families that an idealized nuclear-family mold, and everyone else. Whole communities used such exclusionary zoning as a bulwark against social and racial mixture, a practice that would be litigated repeatedly. Zoning also became a tool for shaping growth, both by limiting heights and densities and by defining urban growth boundaries to preserve agriculture and open space. In San Francisco, debates about the pace and shape of downtown growth resulted in the downzoning of North Beach, Chinatown, and the Tenderloin, and upzoning to the south and east. Zoning was deployed to preserve the historic scale and character of older neighborhoods and to limit new construction along the waterfront in response to controversial buildings like the Fontana Towers. In the 1960s, as urban renewal programs were targeting the social, functional, and visual mixture of the American city for demolition, critics like Jane Jacobs (who also turned 100 in 2016) began to recognize and celebrate that mixture as profoundly important. As planners caught on to the need for a mix of uses, they came up against a major obstacle: in city after city, mixing land uses – and creating the kinds of dense, walkable cities celebrated by Jacobs and others – was illegal. It had been zoned out of existence. Zoning also locked in minimum parking requirements built on the assumption that everyone would drive, so cities came to look like vast automotive storage yards, with blank walls along massive arterial streets. Today, thanks to decades of committed effort, mixed-use zoning is common, and antiquated transportation assumptions are gradually being dismantled. Several other innovative zoning tools have come into use in recent years. Inclusionary zoning requires that a portion of the housing units in a given project be made available below market rate. In some cases, a density bonus is granted for more public benefits, through so-called incentive zoning. Performance-based zoning reduces the regulation of use but instead requires that external impacts like noise, pollution, or traffic meet specific standards. Form-based codes aim to deregulate land use, and focus instead on their physical qualities, including the placement, orientation, height and massing of buildings and is generally applied to ensure that buildings, whatever their function, contribute to an urban pattern that is efficient and walkable. Zoning is not building, and has a complex relationship with market forces. Just because planners zone for something does not mean it will magically appear. In a slow market, no amount of zoning can get things moving,and the wrong policies can create unrealistic expectations about the value of land. High inclusionary requirements or other exactions can render projects infeasible or drive up costs, exacerbating affordability problems. In a hot market, zoning that constrains growth too much can exacerbate outward sprawl or result in soaring prices. While zoning is meant to create certainty, it remains subject to pressure by both moneyed interests and litigious NIMBYs. An important line of critique has also emerged from economists who study the relationship between urban policy and the ability of workers to access opportunity. In many wealthy markets, restrictive zoning established by local homeowners who bene t from housing scarcity impedes housing production, resulting in high costs that effectively prevent people from moving in to take advantage of abundant opportunities. This dampening of what economists call “labor mobility” leaves people stuck in less prosperous regions, a marked contrast to earlier periods like the Great Migration of African Americans out of the rural south into the industrial north. In these cases, zoning has become a tool that serves local interests at the expense of broader economic opportunity. Several states, including Oregon, New Jersey, and Massachusetts have established policies by which state or regional entities can supersede local land use controls if they are adversely impacting affordability or sustainability goals. In California, local zoning is the last word in land use planning, even though it is tangled up with issues like housing and job markets, transportation, and greenhouse gas emissions. As a result, Plan Bay Area forgoes any attempt to tackle local land use authority and instead uses transportation dollars to cajole local governments. Getting zoning right requires a nuanced understanding of many interacting forces, and constant revision and adjustment. As it enters its second century, zoning remains a powerful but imperfect tool, but among the best we have for shaping cities. Benajmin Grant is SPUR’s Urban Design Policy Director. Tacked to the bulletin board in my office is a sticker with a peace sign accompanied by the slogan, “World peace through better zoning.” My early consciousness and worldview of urban planning and city development was substantially influenced by the writings of James Kunstler and the New Urbanists in the mid-1990s, through which I came to see how decades of bad zoning, that is, zoning embedded with the anti-urban auto-oriented vision of mid-20th century forces, was the evil force dragging down our landscape in America — and the source of all ills: global warming, loss of habitat, social fragmentation, economic isolation, poor health, strife in the Middle East, bad hair days, you name it. Zoning is indeed powerful in making sure that what we allow to get built in our environments manifests our highest ideals and our hopefully more-informed contemporary knowledge of what makes for sustainable, exciting, equitable, lovable places. Zoning can either work against our higher goals or support them. When I started at the San Francisco Planning Department in 2001, our fair city’s zoning still was enforcing build-out according to the visions of the 1950s and actively suburbanizing even our most historic neighborhoods required parking, limited densities, separation of uses. The Department’s Better Neighborhoods plans, Market & Octavia being the poster child, was the first effort to methodically question how out-of-sync these rules were with the qualities of the neighborhoods we cherish as well as the need to bring neighborhood residents along in the dialogue. The first decade of the 2000s saw a transformative overhaul and experimentation with remaking many of our core zoning guidance in big chunks of the city: replacing parking minimums with maximums; allowing corner stores in some residential areas; controlling density through urban form and housing policy goals rather than arbitrary limits; urban design standards for active ground floors; requiring new alleyways be cut through large blocks; and on and on. We’ve tackled how we might get more PDR (production, distribution repair) space through zoning incentives); tinkered with open space rules to get more and better public spaces; and created ambitious transportation demand management (TDM) programs through zoning. We keep upping the ante on “value capture” through upzoning schemes. We keep tinkering and experimenting to see how we might squeeze more public benefit out each turn of the zoning knob, improving performance and design just a bit more. We also aim to sort the wheat from the chaff with regards to the new-fangled phenomena enabled by new technology (Car share: good! Home “share”: maybe not so good?) It has been almost too alluring in this economically red-hot city with great demand for growth in space for housing and jobs, to turn first to zoning as a salve. I say this with caution as a “zoner,” someone who thrives on the intellectual challenge of using zoning in creative ways to further policy goals and has made a career out of it: Zoning has created a false god, and lulled us into the naive notion that zoning regulation is the primary tool to solve our thorniest economic and social urban problems, many of which are rooted in rapidly exacerbating income inequality and broader societal, political or macro-economic dynamics. It’s easier to amend some lines of zoning code than to create and fund assistance programs, create and pass a new tax scheme, or spend our time and political capital lobbying for broader legal or political changes at higher levels of government. Because we have local land use control over zoning that regulates our neighborhoods people often think that changes we see happening in our neighborhoods can be stopped with zoning changes. But better zoning is probably not going to keep that thrift store from becoming a high-end boutique (both are retail!) or ensure that neighborhoods maintain or honor their cultural heritage. I wish it would. It would be so easy. We often have to keep reminding ourselves, our colleagues, and the community that planning and public policy is about a lot more than zoning. As we’ve ticked off most of the necessary re-do’s of mid-20th century zoning foibles, we’re now staring at some of the most vexing urban and social problems we face as a city and region— housing affordability, displacement, equity — and we’re going to have to dig deep in the bag of policy tools and own up to some of the bigger collective policy, fiscal and investment questions we face. Joshua Switzky is Senior Manager of Land Use Planning and Housing Policy in the Citywide Planning Division of the San Francisco Planning Department. Duany's "Urban to rural transect" (1999) identified a series of conditions from the urban core to wild nature, and proposed that planning policies changed as densities did. We must code because the default setting in contemporary design is mediocrity or worse. Those who object to codes imagine that they constrain architectural masterpieces (their own, usually). But great buildings are few and the more likely outcome is kitsch. Codes can assure a minimum level of urban and architectural competence, even if in so doing they constrain certain possibilities. We code because bureaucracies cannot be ( and have never been) dismantled. They will however, willingly administer whatever codes are in hand. This has a potential for reform more efficient than education. Codes are currently pervasive. Replacing them with a void is legally unsustainable. It is for us to re-conceive the codes so that they result in better places to live. We must code so that the various professions that affect urbanism will act with unity of purpose. Without integrated codes, architects, civil engineers and landscape architects can undermine each others’ intentions. Without integrated codes, the result of development is never more than the unassembled collection of urban potential. When architects do not control the codes, buildings are shaped by fire marshals, civil engineers, poverty advocates, market experts, accessibility standards, materials suppliers and liability attorneys. Codes written by architects clear a field of action for typological and syntactic concerns. We code because unguided towns and cities tend not to vitality, but to socioeconomic monocultures. The wealthy gather in their enclaves, the middle-class in their neighborhoods, and the poor in the residue. Shops and restaurants cluster around certain price-points, offices and their prestige addresses and sweatshops their squalid ones. Some areas uniformly gentrify, while viable neighborhoods self-segregate and decay. This process occurs in historical cities no less than in new suburbs. Codes can secure that measure of diversity without which urbanism withers. We code to protect the character of speciffc locales from the universalizing tendencies of modern real estate development. We must code so that buildings are durable, and also mutable, in proper measure. This is crucial at the long-range time-scale of urbanism. Without codes, older urban areas tend to suffer from disinvestment, as the market seeks stable environments. The competing private codes of the homeowners associations, the guidelines of office parks, and the rules of shopping centers create predictable outcomes that lure investment away from existing cities and towns. Codes level the playing field for the inevitable competition. We must prepare the new private association codes of developers because it is they who have built our cities and continue to do so. The pro t motive was once capable of building the best places that we still have. Codes can assist in the restoration of this standard. We code in defiance of an avant-garde culture that prizes the alternating extremes of unfettered genius and servility to the zeitgeist. There are positions between. Urbanism intrinsically transcends the limits set by our time. We know that it is possible to affect the current reality and we accept the responsibility. We code because we are not relativists. We observe certain urbanisms that support the self-defined pursuit of happiness (the stated right of Americans). We also observe other urbanisms that tend to undermine that pursuit. Through codes we attempt to make the first a reality. We prepare codes because it is the most abstract, rigorous and intellectually re ned practice available to a designer. And because it is also verifiable: by being projected into the world, codes engage a reality that can lead to resounding failure. In comparison, theoretical writing is a delicacy that survives only under the protection of the academy. We code because codes can compensate for deficient professional training. We will continue to code, so long as the schools continue to educate architects towards self-expression rather than towards context, to theory rather than practice, to individual building rather than to the whole. We look forward to the day when we will no longer need to code. Andres Duany is Partner at DPZ. Envelope A+D's PROXY project in Hayes Valley explores the potential of impermanence. As the architects of two San Francisco projects employing temporary architectures and interim uses, we have spent the last five years working in zoning limbo. PROXY Is a temporary activation of two city-owned vacant lots in the heart of Hayes Valley. NOW Hunters Point is our community-focused program of interim uses at the former PG&E Hunters Point power plant site. Both projects explore the potential of impermanence to activate fallow land resources and point toward the viability and poignancy of possible future (permanent) uses. In many ways these projects form a new category of work, one that uses the current moment as a way to prototype the future city, outside of normative planning criteria and processes. Through impermanent architecture we actively program these two sites to help change the perception of place in the here and now, but also to learn how these very short-term uses and events illuminate what the more permanent condition could be. 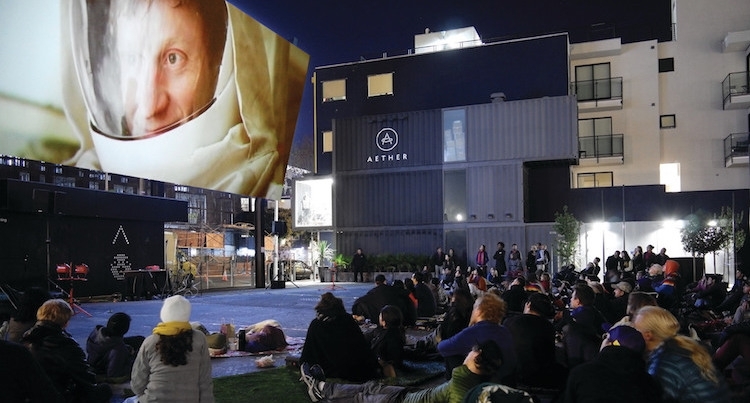 This work is called many different things — “phase zero” by developers, “spontaneous interventions” by curators, “temporary urbanism” by architects, “pop-up” structures by everyday people — but this movement is aligned under a common goal of activating the city in places that have been underutilized. In our view, interim uses are a deep form of community engagement that happens over an extended period rather than a few community meetings. Through an ongoing dialogue and the opportunity to actually experience a proposed use on a temporary basis, temporary use invites a broad range of inputs from diverse stakeholders into what the city could become. Could this notion of prototyping the city through temporary uses be embedded in the processes and language of the zoning code as a way of encouraging the city to learn from itself more quickly? Our current zoning only considers two durational categories: the event and the permanent building. Could zoning instead become more of a gradient? In this scenario, rather than a singular mixed use, zoning would allow for a broader range of uses on a temporary basis with the goal of gaining a deeper understanding of how a certain use resonates with its surroundings. If blocks, neighborhoods or districts agree on what is important for their residents and businesses — temporary housing, job training, health initiatives, community cohesion, vibrancy — could the code allow for these (perhaps radical or innovative) uses be tested for short defined time periods? Our dream for the code is that zoning criteria could open up to these new efforts at seeding the future city, through nuanced criteria that takes into account the duration of the use and through the creation of intelligent approval processes to accommodate short, middle, long and very long term interventions within the fabric of the city. Douglas Burnham is Principal of Envelope a+d. 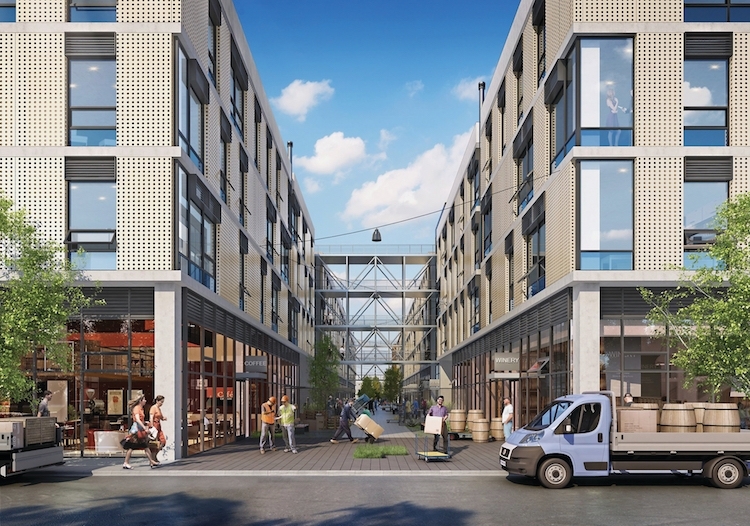 The 100 Hooper project includes over 300,000 rentable, affordable square feet of designated PDR (production, distribution, and repair) space in addition to office space. The past one hundred years of zoning in the United States established legality and basic form and procedures, reflecting its nuisance based origins. The next hundred should build on that foundation, address zoning’s fully visible flaws and develop coherent, valid and effective zoning codes to deal with the imposing demands of future urbanization. Public comprehension of zoning code content has diminished as its scope and complexity have expanded. 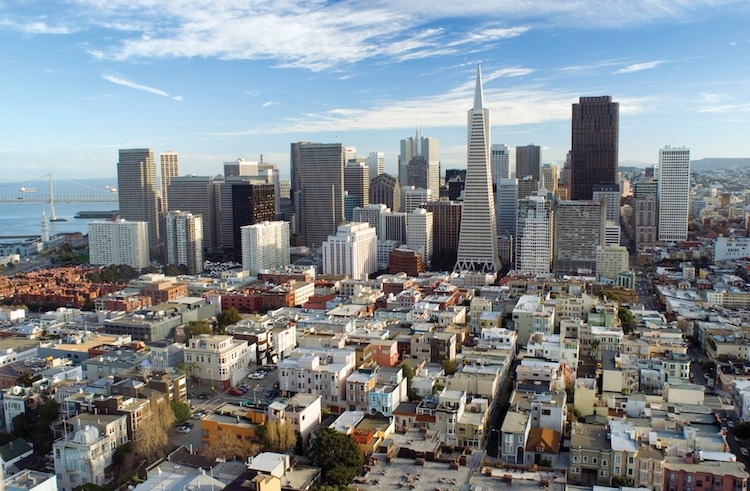 With layered amendments and layered maps, mostly in larger cities and dramatically in San Francisco, zoning regulations have become massive, forbidding and impenetrable for all but the most sophisticated practitioners. Each new form of regulation is awarded its own section of codes, without preserving a well-ordered overall structure. A procedural bias toward ad hoc review and official decision-making also has emerged. This is paradoxical, although perhaps spawned by an unwillingness to navigate the byzantine codes. The philosophical underpinning of that rush toward human judgement was articulated in the 1960s by a prominent lawyer and planning leader, Richard Babcock, who saw zoning as a “game” (his book was actually entitled, “The Zoning Game”), where adversarial advocates engaged in legalistic jousting. The end-result, he contended, would be an Adam Smith-like balancing of interests leading to the best possible outcomes. This trend also was fed by the advent, in 1972, of the environmental impact report on individual projects, along with a new awareness of environmental issues and variants. Ever since that crucial decade, zoning codes have expanded steadily while the case-by-case jousting also continued. The end-result is that 50 years after this zoning watershed, we have as its legacies the worst of both trends — frequent and brutal zoning clashes right along with mammoth and opaque codes. The result: rampant uncertainty and low participation and interest. Plato, Locke and John Adams enjoined us to follow the “rule of law not men” (authors note: “not people” would be today’s enlightened equivalent.) For zoning, this would help us refocus on our zoning codes, making them more explicit, valid and understandable, while reducing reliance on contentious one-time, one-project review procedures. Conflicts should be resolved at zoning code adoption. Zoning may then be made more consistent with our adopted plans which can help it withstand the onslaught of one-time project approvals more readily. (Eliminating environmental impact reports, an inefficient process parallel to zoning which has diverted staff resources and that rarest of all planning commodities – public attention, also remains a worthy goal.) To paraphrase a memorable television expression, our next century’s mission, if we choose to accept it, is to seek code and zoning map content that is explicit and understandable, and can be used affirmatively to accomplish community goals, and not just prevent adverse uses. This can be done by clear pre-statement of zoning policy before new development is subject to highly-charged political deal-making. To the greatest possible extent local zoning decisions should be made by laws not people. Paul Sedway, FAICP, is an urban planner and author of “Land and the Environment: Planning in California Today” (1975). Zoning has come a long way, especially in how we think about “mixed use.” But most examples of mixed use zoning still largely focus on mixing “main-street” types of commercial/ retail use with residential — either adjacent parcel by parcel or “mixed-use” zoning, which allows commercial over retail or residential over retail. As an advocate for “urban manufacturing” — which very explicitly brings not just commercial but “industrial use” into the heart of urban areas — SFMade (and sister non-profit PlaceMade) sees a further opportunity for how we think about “mixed use”: focusing on adding in industrial/ manufacturing/maker-based uses into residential and commercial areas. We are expanding how we think of mixed use zoning typologies. In the case of our project at 150 Hooper, we are creating zoning that enables multi-story projects combining office/ commercial with industrial or combining residential, commercial and industrial/ manufacturing all into the same building. We need to also look at encouraging uses to cluster in “districts” as a different way to bring together like-minded uses and users, whether design/manufacturing districts, artist live/work districts or innovation districts. The devil is in the details, of course. Kate Sofis is CEO of SFMade. A map of New York City’s zoning law, passed in 1916, which shaped the setback massing of high-rises across Manhattan. The last 100 plus years of zoning is a story of protecting and creating healthy places for society’s less powerful. It is also a story of segregation and privileging the wealthy and well-connected. New York’s landmark zoning legislation in 1916 changed the city’s skyline and the form of skyscrapers to come in order to protect the public’s health, safety, and welfare by ensuring light and air on the streets for every New Yorker. Even earlier, New York’s Tenement House Acts of 1867-1901 forced builders to abide by basic rules for light (an outward facing window for every room), ventilation, and sanitation. The by-product of this law was a building type transformation from a basic box to a dumbbell form with lightwells. Around the same time, San Francisco passed its first zoning laws, using similar language of health and safety. Yet here, zoning was a means to control who could do business in the city. These laws, passed in the early 1880s, required discretionary review for laundry facilities that operated in wood buildings in an effort to protect against fires. The vast majority of laundries were Chinese-owned and housed in wood construction. The thinly veiled laws criminalized the operation of these Chinese laundries, directing enforcement and arrests at Chinese owners while providing licenses to white owners. Litigation quickly elevated the issue to the U.S. Supreme Court, which in 1885, overturned the discriminatory legislation, yet throughout the 20th century zoning laws across the country tell a tale of simultaneous societal progress and discrimination. Over a century later, who do our zoning laws serve? The same contradictions persist today. Zoning is a blunt tool that we often try to stretch beyond its means. The effects are not always what we intend. For example, San Francisco wants to make it easier for more families to live here. Over the last decade, the city established zoning controls in some districts that require a higher percentage of two and three bedroom units in new residential projects. A solution in theory. But in practice, these larger units are often used not by families but for young workers living as roommates. Another example: the city wants vibrant streets and space for retail and services. San Francisco established zoning controls to limit the ground floor of many areas to retail. In practice, particularly when the economy is weak, storefronts are empty if retailers aren’t available or can’t afford the new spaces. San Francisco requires a high percent of glass or transparency on those ground floors, again to promote activity on the street. Yet so often, the large glass expanses of new buildings feel corporate, impersonal, and uninviting. Zoning can’t guarantee good design, but I believe it can be a tool for good urbanism. Do our laws encourage places that are healthy, humane, and sustainable? We monitor compliance, not performance. What if we measured both? If we did, we might see that the tale of zoning is often a tale of two cities. Wealthy, owner occupied neighborhoods successfully lobby for low height limits and density caps, creating de facto housing moratoriums. In contrast, neighborhoods populated by recent immigrants, renters, and low and middle class residents disproportionately host the city’s growth, new construction, affordable housing, and major infrastructure. It is no surprise that these impacted neighborhoods resist rezoning efforts. The collective good may benefit from upzoning to increase density, public space, and affordable housing but it’s not really a collective good if only one half of the city serves as host to the city’s future needs. My hope for the next 100 years of zoning is that we regularly test and measure (however possible), the outcomes of zoning in the places that are the focus of rezoning efforts and in the places that are not. Laura Crescimano is Principal at SITELAB Urban Studio. 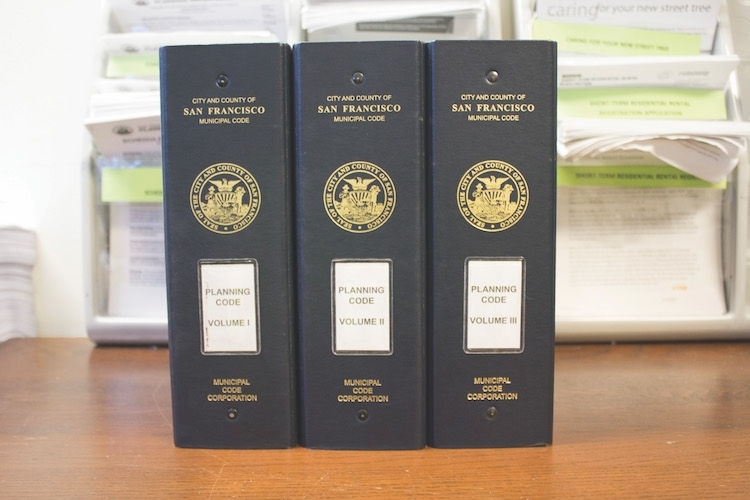 The San Francisco Building Code takes up three binders and is over 2000 pages long. Once federal regulations, design guidelines, building safety and energy efficiency requirements, historic preservation zones, and infrastructure considerations are brought into the mix, California’s city planners are left to navigate not only a Byzantine but an often contradictory set of rules. A city planning department may want buildings to have stoops and require them in design guidelines, but accessibility regulations in building codes require wheelchair accessibility. Fire departments advocate for wide streets in order to maneuver and park large vehicles during an emergency, but urban design guidelines often require narrower streets and curb bulb-outs to increase safety by lowering traffic speeds. Some of California’s own largest policy initiatives are at odds with each other. The state will require net-zero housing by 2020 and net-zero commercial buildings by 2030, meaning these buildings will use the same amount of energy as they generate. This is fairly easy to do in the suburbs, where more land is available for on-site energy generation. But it is nearly impossible to accomplish in cities at the scale required. At the same time, SB 375, the state’s Sustainable Communities Act, encourages better coordination between land use planning and transportation in order to reduce the number of vehicle miles traveled (VMT) as part of the state’s initiative to reduce greenhouse gas emissions. It is nearly impossible to do both of these things at the same time. Reducing VMT requires density, but density is nearly impossible to achieve while constructing net-zero buildings, unless transportation emissions for the site are taken into account when measuring the environmental impact of a new building. Even where layers of code aren’t in conflict with one another, they can be in conflict with neighborhood groups. In California, which allows for a great deal of citizen participation in the planning process, it is not uncommon for neighbors to object to projects that will introduce rental apartments or taller buildings even where they are allowed in the existing code. If only life could imitate art — or popular culture anyway! New housing in California has come to mean either auto-dependent sprawl or expensive high-density apartments and condos in the urban core, but to really make a difference we have to allow the kinds of middle-density development like the low-rise Melrose Place apartments or the Full House in-law unit in all of our communities. Disallowing this kind of gentle medium density in the name of preserving neighborhood character does a disservice to those who arrived here or were born too late to afford a single-family home within commuting distance of their jobs. It also fails to recognize that making communities more walkable and sustainable will improve neighborhood character over time, not diminish it. Mark Hogan is Principal at OpenScope Studio.This essay excerpted from “Re-coding Planning,” BOOM California, (Spring 2016).